Tired of Seeing Buttercup in Your Pasture? Tired of looking out across your pastures/hay fields and seeing that “sea of yellow” every spring? One of the signs that spring has arrived is when the yellow flowers of buttercup begin to appear, but it’s during the winter months that the vegetative growth of buttercup takes place. As a cool season weed, this plant often flourishes in over grazed pasture fields with poor stands of desirable forages. In fact, many fields that have dense buttercup populations are fields heavily grazed by animals during the fall through the early spring months. Buttercups are sometimes classified as short-lived perennials, but often grow as winter annuals. Buttercup is toxic to all species of livestock. The toxin protanemonin is released when the plant is chewed or otherwise wounded and is present in all parts of the plant. Animals that eat buttercup may suffer from blistering of the mouth and internal parts of the gastrointestinal tract, diarrhea, colic, and, in severe cases, death. 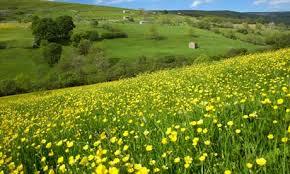 Fortunately, most animals will not eat buttercup because it is unpalatable. 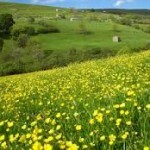 The toxin become inactivated when dried so buttercup is not a concern in hay. Most buttercup plants emerge from seed during the fall or late winter months. Therefore, pasture management practices that improve and promote growth of desirable plants during these months is one of the best methods to help compete against the emergence and growth of this plant. Mowing fields or clipping plants close to the ground in the early spring before buttercup plants can produce flowers may help reduce the amount of new seed produced, but mowing alone will not totally eliminate seed production. An effective weed control program is essential to establishing and maintaining highly productive pastures and animal performance. We need to remember that “An ounce of prevention is worth a pound of cure.” Select well-adapted grass and/or legume species that will grow and establish rapidly. This will minimize the length of time for weeds to invade easily. Lime and fertilize according to soil test recommendations. Proper pH and nutrient status will help insure that the forage will grow rapidly and be more competitive with weeds. Manage grazing properly. Overgrazing is a common cause of weed problems. Heavy grazing pressure may favor weed growth over grass. Identify weed problems and location and select which option or combination of options you plan to use for weed control (mechanical, chemical, or grazing management), but the most important is to put it in practice and evaluate the outcome.